But out of the blue, weird things start happening. Scary things. She nearly gets knocked down by a runaway car. People start getting hurt. It seems like someone doesn’t want Leslie to make it to sweet sixteen. Hi guys! How’ve you been? I’ve been great, lots of exciting stuff happening (to any American readers with Arthritis you may see my face advertising your medication very soon [Wing: Well that’s interesting! ]), but I’m so happy to be back doing a recap which I hope y’all enjoy! As a child I really liked this book and really wanted a huge sweet sixteen….I’m going to be honest, while reading this book I kept trying to remember what I did for my sixteenth and I have absolutely no memory of even turning 16. I think I went for a meal with my friends? Or we snuck out and went clubbing? But I did that a lot so it wasn’t a sixteen thing, it was more like a Saturday thing. I remember when I turned 13 I went to the cinemas with a bunch of friends and my mum. In my family, it was more of a celebration to turn eighteen or twenty-one. I definitely remember my twenty-first, I don’t remember my eighteenth. I may need to see someone….. 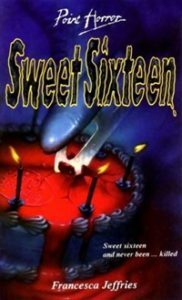 Anyway I did enjoy this book, it wasn’t as awesome as I remember but I didn’t hate it (Side eyes Halloween 2) The ableism was annoying as hell but there wasn’t a lot of it and Leslie was a solid character who was easy to empathise with.